Broken Link Hijacking (BLH) is lesser known attack.there is an brief introduction & exploitation about it by EdOverFlow. There is an already fully customize package for discovering BLH endpoints, https://www.npmjs.com/package/broken-link-checker but setting it up is really painful,Authentication based link validating was also an problem with it. 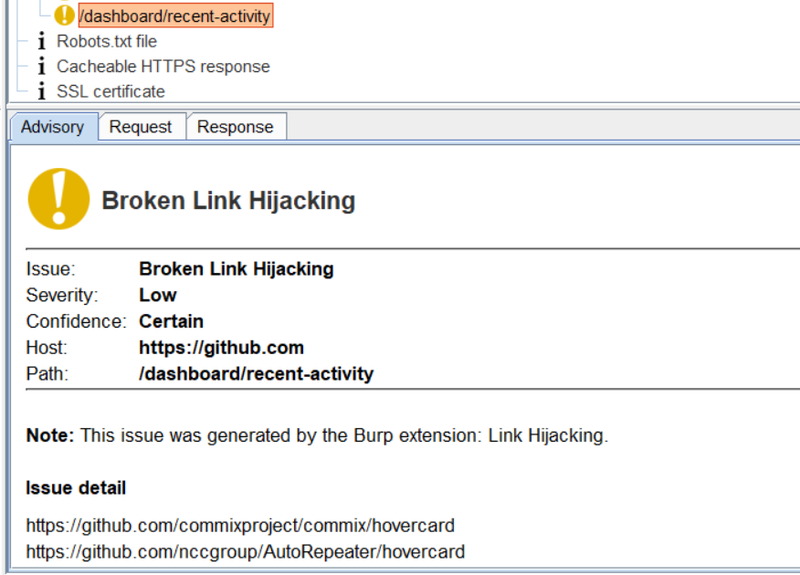 Burp Extension to discover broken links using IScannerCheck & synchronized threads. Concurrently checks multiple links using defined threads. WHITELIST_CODES - You can add status_code's to this list for more accurate results. ex: avoiding https redirects by adding 301, if the path,url redirects to https. WHITELIST_PATTERN - Regex extracting pattern based on given patterns. WHITELIST_MEMES - Whitelisting MimeType to be processed for scanning patterns in responses if their Mime-Type matches. 2 Ways it outputs the broken links. Broken Links which belongs to external origins. Broken Links which belongs to same origins. If there are no external origin broken links then look for same origin broken links & return same origin broken links. if there are external origin broken links & same origin broken links then return only external origin broken links.